January and February in Pennsylvania don’t give many opportunities to observe flowers or growing herbs, except for the ones we take indoors. Light has to be made available from a sunny window or from an artificial source if you want to see the plants stay healthy. I tried something new this fall and dug up some begonias that were real pretty growing at the edge of the woods. Outdoors they seemed to like their spot in the shade of the trees, although they did get a little morning sun. They were taken up before freezing weather hit and planted in a couple large pots with some potting soil. I was surprised that the plants did so well and even grew throughout the winter. 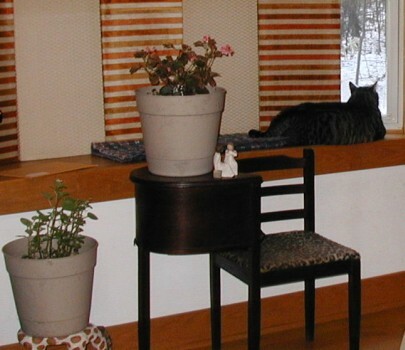 The pots were placed near a south-facing window so the begonias could get as much sun as possible. Lil’ Scoshe at the south-facing window near the begonias. The begonia plant on the higher stand was able to get more sunlight and it grew better and flowered a lot more than the begonia on the lower stand that didn’t get as much sun. Potted begonia dangerously close to the cat overlook. Photos taken 10Jan2009. 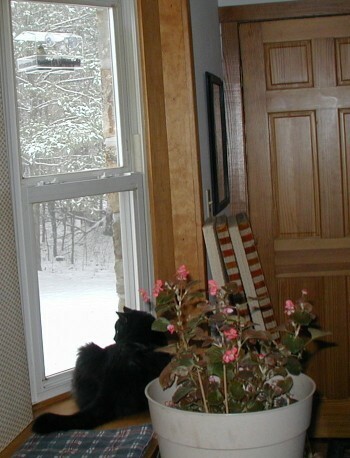 The window-attached bird feeder is a great entertainment center for the cats during the winter. Unfortunately, the plants nearby often get clobbered when the felines get a little frisky. At times over the course of the last couple months a playful kitty caused a few stems of the begonia to be broken. Pushing the broken stems right into the soil, even without any root-tone, was all that was needed. I was really surprised that the stems took off growing more stem and flowers so quickly. For about 3 days the stems looked a little bent over or wilted, but then they came back around to start re-growth. I had never had begonia plants before, either indoors or out. I was pleasantly surprised as the begonias treated us to non-stop flowering in shades of red, pink and white. I highly recommend these ‘old time’ flowers for splashes of color in your garden, along walkways or indoors near a sunny window.